DREAMY HEALTH: A SET OF EXERCISES TO RELIEVE FATIGUE WHEN WORKING AT THE COMPUTER. A SET OF EXERCISES TO RELIEVE FATIGUE WHEN WORKING AT THE COMPUTER. If most of the time you spend sitting at a computer, you're probably familiar with the feeling of discomfort and stiffness in the body, is aggravated by the end of the working day. But it is in the best case. In the worst pain in the neck, shoulders and lower back, along with a headache has been the inevitable "side effect" of office work. Plus reddening towards evening eye inexorably deteriorating vision and our eternal stone on his back and neck - bad posture. Needless to say that the practice of yoga is able to get rid of most of these problems? But what about those who are not yet addicted to regular classes? To rejuvenate, relax aching muscles, relieve tension in the neck and shoulder girdle, as well as stimulate blood circulation in this area, follow the simple complex. It does not require any training or special materials. This workout can and should hold right in the office! And relieve fatigue eyes and help preserve vision special exercise. Sitting behind a desk, get the object that is far away from you, ideally - skyline. Periodically to keep your eyes from the screen and look at it. 1 Poluuttanasana, elbows on the support. You can stay in the shoe. Stand facing the pole. Put the foot on the width of the hips parallel to each other. 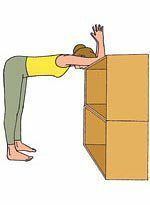 Lean forward, bending at the hips, lower your elbows on a support and placed them on the shoulder-width apart, palms together.Completely relax your head, face, neck and abdomen. Firmly push the palms together. Without moving the elbows to the side, more and more of a relaxing neck and head as you exhale. 2 Poluuttanasana, hands on support. Step away from the support a little further. Foot is still hip-width apart and parallel to each other. Lean forward and place the palms on the support. Pushing them, do not let your elbows bend down. Retraction of the blade from the neck and draw the upper back. On the exhale, relax your head and neck. 3 Working hands against the wall. Stand sideways to the wall. Pull your right hand to the side and put his hand on the wall, fingers pointing up. Do not bend the arm at the elbow. Retract the shoulders, lengthen and extend your hand. Stay in this position for 1-2 minutes, and then repeat in the opposite direction. 4 Work hands against the wall. Stand against a wall with the right side and pull the right arm, pinning her to the inner surface of the wall. Based shoulder, be turned away from the wall so that the area under the right clavicle stretched. 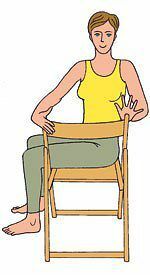 Lower the shoulders down.Hold this position for 1-2 minutes, and then repeat in the opposite direction. 5 Parvatasana on a chair. Sit on a chair and straighten your back. Extend your arms in front of you and twist your fingers. Pull your elbows and inhale, raise your arms up. With each breath, raise your hands up, without losing traction on the exhale. Expand the upper arm so that the triceps move forward, and biceps - back. Hold down fingers and palms in the same plane. On the exhale, lower your arms down. Change the interlocking fingers and do the pose again. 6 Bharadvadzhasana on a chair. Pose Dedicated to the Sage Bharadwaja. Sit in a chair with the right side to the back. Feet hip-width apart and parallel to each other. Lengthen the spine and turn around to the right, taking the back of his hands. Inspiratory pulling up, exhale twist the right. Retract the shoulders, draw the edges of the left side of the back, serve the area under the left clavicle forward and upward. To happen in a pose twisting pelvis should be sustainable. To do this, press down the foot to the floor, point your right knee forward and extend the left leg from the knee to the pelvis. Hold asana for 1-2 minutes, and then do it the other way.